Visit us in January of 2019 for information about next year's camp! Cost: ¥130,520 (payable via bank transfer) Includes all meals, activity fees, lodging and public transport to and from Tokyo. Camp Overview: Adventure Beach Camp is an English language, week-long, overnight camp which takes place on the shores of Yumigahama Beach. Campers immerse themselves in nature, build, tinker, swim and even surf. Activities include: (but are not limited to) foraging for seaweed, building rafts and traps, constructing elaborate beach-side marble runs and bamboo luge routes for our somen noodles, tide-pooling, coastal hiking and surf lessons. From starfish to incredible starry nights, this experience is what "tween" dreams are made of. Safety: Our staff is made up of seasoned, international educators who have been background-checked, and our team includes a registered nurse and a Red Cross-certified life guard. (Please read more about our highly qualified staff in the section at the bottom of the page.) We also have relevant emergency protocols in place in the event of an earthquake and our camp is fully insured. *If your child has a special learning or medical need that might normally exclude them from participating at a sleep-away summer camp, talk to us! We value inclusion and want to make our program as diverse as possible, while keeping the camp safe for all participants. Schedule: There will be 3 activitiy periods each day (morning, afternoon and evening) interspersed with meals and meal preparation. The activities will be determined by the weather and tides on a daily basis. 8:30-9:30pm Shower and lights out. Fun Food: We take food seriously, and our meals are made with as many fresh ingredients sourced from the Izu peninsula as possible. Campers and staff work together to prepare meals, eat and clean-up; and don't forget the fun! We'll make pizza in a wood fired oven, use bamboo to build noodle runs for our nagashi somen, and roast fish and vegetables (and marshmallows!) over an open fire. Every meal is an event; a chance to enjoy good conversation, delicious flavors, and a little rest before we move on to the next activity. Ocean Ecology: Campers will have the chance to appreciate the Pacific Ocean both for it's mesmerizing recreational opportunities (surfing and stand-up paddle boarding) as well as its incredible biological diversity. We will spend part of each day exploring the beach and looking for seaglass, seaweed, tide-pool organisms (ex. sea hares and sea squirts), floating pumice stones, or just lying in the glorious, warm Izu beach sand. Build/Tinker/Make: The beach is a special place filled with incredible man-made and natural design materials. 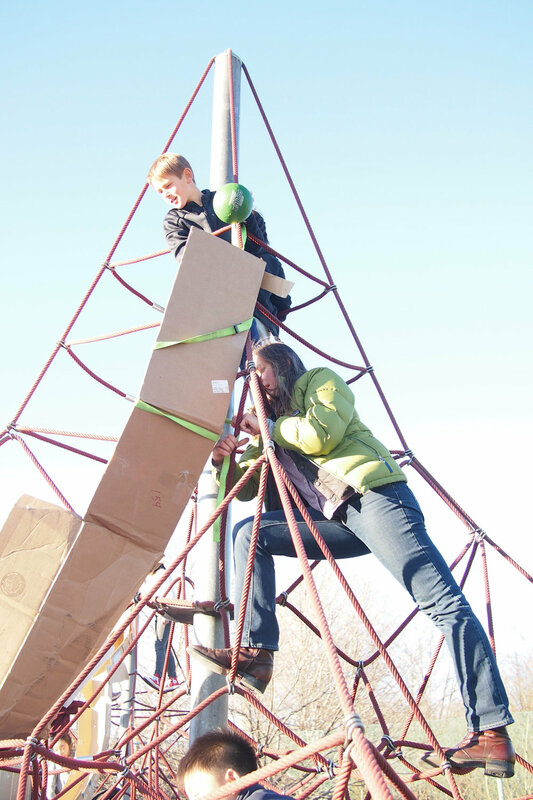 Campers will be faced with multiple design challenges, and the opportunity to work as a cohesive group to build, tinker and remake, until their designs are up and running. Projects may include rafts, forts and wind or wave-powered machines. We'll also engage in hands-on making experiences like noodle and marble runs, as well as learn the skills of cooking and fire building. Technology Free: So that kids can be fully present, camp is tech-free. Camp staff will carry phones, and will be available if you need to reach us 24 hours a day. We will be posting photos to our instagram feed if you are interested to know how the surf is breaking and what kinds of creatures we are finding in the tide pool. If students choose to bring phones with them for the ride down to Shimoda, we can safeguard their phones once we get to Yumigahama and until we get on the train to come home. We really want this to be an experience that allows kids to be themselves, connect with nature, and connect with each other through shared experience and face-to-face conversation. I spent the first 10 years of my life in the USA, Minnesota and Wisconsin. Then, the event that changed the course of my life: My dad was sent to Japan as a missionary! For the next 8 years I lived in Japan and attended international schools. My love for Japan grew, and with great sadness I left at the age of 18. But, thanks to my Japanese husband, I ended up moving back to Japan as an adult. I am a nurse! In Japan I have been blessed to find rewarding work as a school nurse for more than 20 years. I discovered the southern Izu peninsula years ago, and particularly fell in love with the quaint town of Yumigahama. The ocean, the rocks, the sea glass, the warm water, the lush vegetation, the friendly people… I think it is my favorite place on earth. 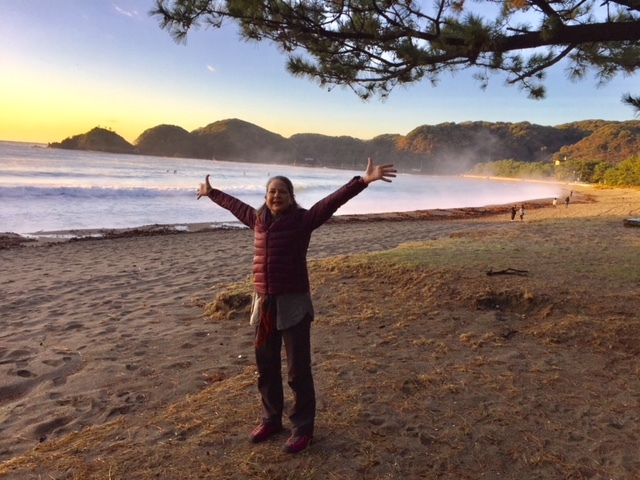 Adventure Beach Camp in Izu is a dream-come-true for me. The first five years of my life were spent on an Australian farm - “don’t go down near the chicken coop without an adult - there might be snakes” my parents would remind me. Dogs and cats were not pets, they were for rounding up sheep and keeping the mice out of the shearing shed respectively - I spent a lot of time outdoors roaming the paddock around our house. When we moved into town I would spend my youth back in the countryside riding horses, or out on the lake sailing. Family holidays meant exploring ocean rock pools. My first year in Japan was when I was 17 - oh how I missed the blue sky, wide open spaces and greenery! I’ve now lived more than half my life in Tokyo and I still miss the space - but Izu offers a taste of that. I am a middle school Japanese language teacher with a passion for sharing the great things about this country. I’ve been involved in camps for Japanese and other students from around South East Asia and with my husband (also from Canberra) we have raised three bilingual children now aged 20, 18 & 15. I love to garden, sew, build, take pictures, do science experiments with my children, and make things out of cardboard. Previously an elementary classroom teacher, I have been working in project-based, maker-style education for the last 5 years, developing programming both in the U.S. and Japan. Tokyo has been an amazing home to my family for nearly 10 years now. Growing up in the Mid-West of the U.S., I rarely had the opportunity to visit the ocean. Izu's beaches, with all of their colorful seaweed, crabs, sea slugs, and batwing sea stars have totally stolen my heart! I can't tell you how excited I am for the opportunity to work in a living classroom. I'm director of The Warehouse and a co-collaborator for Adventure Beach Camp and Adventure Building Camp. Nature is where I feel most at home. I always recharge my batteries in the woods or by the ocean and these are places I like to spend as much time as possible. As a kid, I had access to a 10 acre park that had a small stream, overgrown fields and a hemlock grove, and these wanderings planted the seed for my future outdoor adventures. Currently, I teach middle school science at an international school in Tokyo. I'm also a Red Cross certified lifeguard, a former whitewater river rafting guide, science field station technician, Appalachian Trail thru-hiker, bus driver, caterer and camp counselor. I have taught in schools in Colorado, USA, Cairo, Egypt, Karachi, Pakistan and Tokyo, Japan. I spend most of the summer in Marquette, Michigan, USA working at Adventure Building Camp. I am Amber’s husband and a father to two wonderful girls, Eleanor and Iris.